The Rapid Flow unit is available in 12 sizes from 315 litre up to a generous 2000 litre unit. Wilson Rapid Flow dairy water heaters are designed to deliver a flow rate of approximately 180 litres per minute of hot water at a temperature of between 95-96 degrees Celsius. All units are fitted with adjustable thermostats and supplied with tip to toe and element anodes. The range of units available allows for the correct choice to be made to suit all cleaning programs: as a rule of thumb, 25 litres per set of cups per day. Wilson have available four flexible options depending on your requirements e.g.. the traditional copper cylinder with colorbond case ranging to the premium stainless steel cylinder with polished stainless steel outer case. With electricity costs a major concern, the Rapid Flow unit makes use of off peak electricity rates, therefore making the heating of water more cost effective. Booster elements are fitted to restore any heat loss between the morning and afternoon milking. 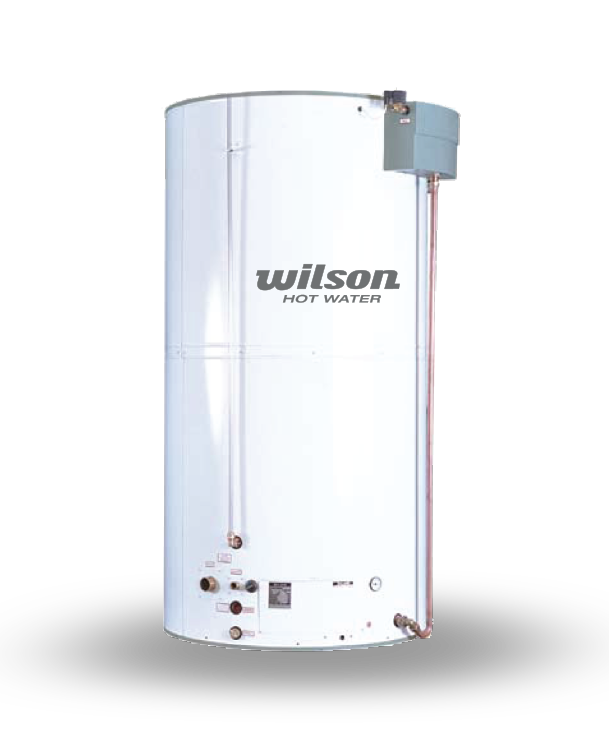 The Wilson unit has an aesthetically designed polyethylene cold feed supply tank which fits neatly onto the side of the RF unit, keeping the overall dimensions of the water heater to a minimum. All dairy hot water heaters are insulated with highly efficient polyurethane insulation to provide maximum heat retention.